In the food and beverage industry, bottling is used for a wide array of storage solutions. From bottled beverages to medicines to cleaning products and more, there are lots of modern products that are packaged and stored in bottles. To prevent the product inside the bottle from going bad, manufacturers often use Nitrogen gas to displace oxygen and moisture. The most efficient way to do this is with the use of a Nitrogen Generator (See more: Bottle Manufacturing with Nitrogen Gas). 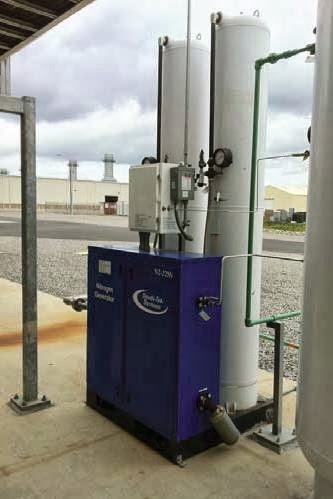 Nitrogen Generators create an on-demand supply of N2 gas from the surrounding air. This prevents the risk of accidental run-out during critical operation times and can be significantly less expensive than relying on high-priced contracts with gas suppliers. The dew point of Nitrogen is extremely low, which means there is very little chance of moisture developing within the bottle when Nitrogen is used to displace the oxygen. Its inert properties prevent it from being combustible, which makes it a very safe gas to work with in a manufacturing environment. Without the use of Nitrogen, the risk of oxidization is greatly increased. Oxidization is a reaction that occurs when oxygen and moisture are present. In the bottling process, if moisture and oxygen are present, the quality of the bottled product can be compromised. Mold may grow, the product may lose its effectiveness, taste may be altered or carbonation could be affected. By using Nitrogen to displace the unwanted elements, the product can be preserved to increase shelf life and the consumer can be satisfied. A Nitrogen Generator installed at the point of process allows the bottling facility to reduce production costs, maintain environmental safety and help keep the operation running smoothly. Many manufacturing facilities are surprised to learn just how much money they can save by switching to a Nitrogen Generator from South-Tek Systems. South-Tek Systems is one of the leading manufacturers of on-demand Nitrogen generation systems. They offer free cost analyses to help facilities see how much they could potentially save by switching from high-pressure N2 cylinders to an on-site N2 Generator. To receive your free analysis, visit www.SouthTekSystems.com or call (888) 526-6284. We look forward to answering your questions and assisting in your Nitrogen generation needs.